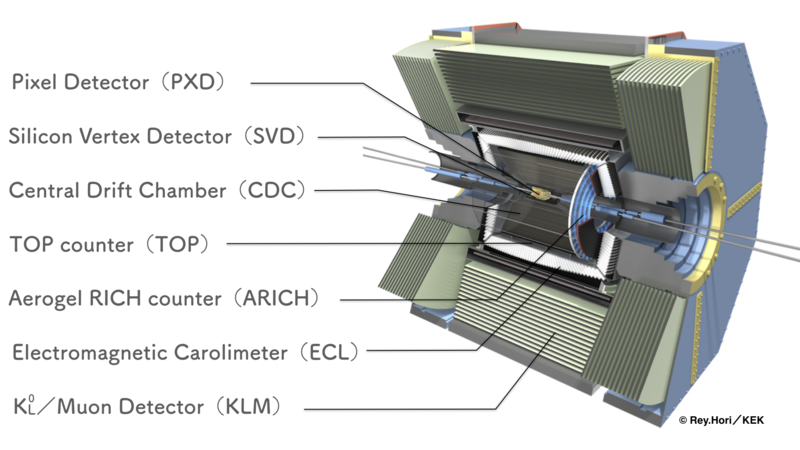 Last month, KEK began a new stage of operation of the SuperKEKB electron positron collider, with a brand new positron damping ring, a new extremely complex system of superconducting final focusing magnets, and the Belle II detector in place at the interaction point. A beam of electrons was successfully stored for the first time in the main high energy ring on March 21st. A beam of positrons was also successfully stored in the main low energy ring on March 31st. Since then, final accelerator tuning of the two beams for collisions at the center of Belle II has continued for several weeks. 1) Bhabha scattering event; The electron-positron scattering process, which is named after the Indian physicist Homi J. Bhabha. hadronic events; Hadron production processes caused by the collision of electrons and positrons. A hadron is a composite particle made of quarks held together by the strong force. Hadrons are categorized into two families: baryons, made of three quarks, and mesons, made of one quark and one antiquark. Pair production of a B meson and an anti-B meson is an example of a hadronic event.